Teagasc’s Derrypatrick suckler herd is projected to make almost double the net profit of some of the countries best suckler farmers this year. The Derrypatrick farm was established at Teagasc, Grange, Dunsany, Co. Meath in 2009 for the purposes of research demonstration to Irish beef producers. The farm size is 65ha and all of the land is situated in one block with a good network of roadways servicing 79 grazing divisions or paddocks. Outlining the financial performance of the herd in 2015, Teagasc’s Adam Woods said it is apparent that the margin achieved is largely due to the high level of output (24% greater than the top third of the Teagasc eProfit Monitor farms). 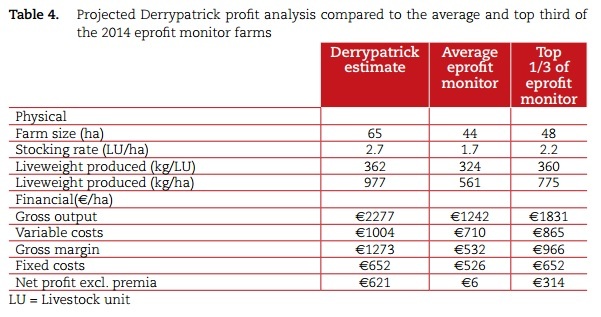 “The gross margin is the best measure of technical efficiency and is projected to be close to €1300/ha for the Derrypatrick herd in 2015. “When full costs are considered (including overheads and facilities costs) net margin is expected to exceed €600/ha,” he said. The Derrypatrick system is based around high grass growth and high grass utilisation. So far, the farm has grown 12,992 kg dry matter (DM), with 10,593 kg DM/ha of this coming from grazed grass and 2,398 kg DM/ha coming from conserved grass silage. On average, each of the 79 paddocks was grazed 4.9 times – this includes the silage fields. 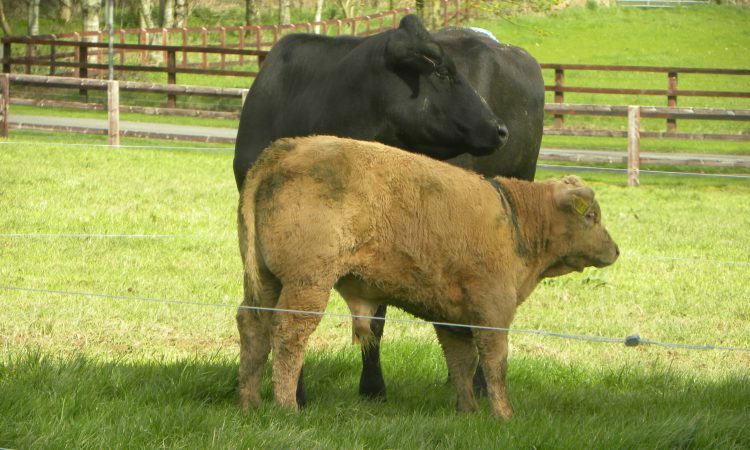 For bull and heifer progeny in the Derrypatrick herd, approximately 50% and 70%, respectively, of slaughter weight will be achieved from grazed grass. The majority of the cull cows were finished off grass, with cows getting concentrates from September 9 until slaughter on September 29. Concentrates were fed to cows and calves to aid the weaning process. To date six Aberdeen Angus heifers and four Aberdeen Angus steers were slaughtered directly off grass with no concentrates fed to them. Late maturing heifers have recently been split into two groups with 15 heifers destined for slaughter off grass and the remainder to be housed for indoor finishing. All steers and heifers for finishing at grass were started on concentrates on 9th September and are currently being offered 5 kg/head/day. The late-maturing heifers, which are predominantly Charolais-sired, currently weigh 563 kg, while the late-maturing steers currently weigh 610 kg (30/09/2015).